Incidence and variation of postoperative complications after hepatic resection in Maryland hospitals. Hypothesis High-volume centers provide superior quality care and therefore have a lower incidence of postoperative complications. Design Observational statewide administrative database. Setting State of Maryland, nonfederal acute-care hospital (n = 52), performing liver resection (n = 35). Patients All patients discharged after undergoing hepatic resection from 1994 to 1998 (N = 569). Main Outcome Measures Two sequential analyses using multiple logistic regression of in-hospital mortality were performed to determine the relative importance of preoperative case-mix and postoperative complications. Results The overall in-hospital mortality rate was 4.8% and was significantly lower in high-volume hospitals (2.8%) than in low-volume hospitals (10.2%) (P<.001). After adjusting for case-mix in the multivariate analysis, low hospital volume was associated with a 3-fold increase in mortality (odds ratio, 3.1; 95% confidence interval [CI], 1.2-7.6; P = .02). Having surgery at a low-volume hospital was associated with increased rates of several postoperative complications: reintubation (relative risk [RR], 2.5; 95% CI, 1.8-3.4), pulmonary failure (RR, 2.3; 95% CI, 1.6-3.5), pneumonia (RR, 0.35; 95% CI, 1.0-5.6), acute renal failure (RR, 2.0; 95% CI, 1.1-3.7), acute myocardial infarction (RR, 2.6; 95% CI, 1.2-5.9), and aspiration (RR, 1.4; 95% CI, 0.9-2.0). When considering all other factors using statistical methods, hospital volume was no longer associated with mortality. Conclusions Patients who undergo hepatic resection at low-volume hospitals are at a higher risk of postoperative complications and death than those who have the same operation at high-volume hospitals. The empirical difference between outcomes at high- and low-volume hospitals seems to be due to a variation in postoperative complications. Complications after high-risk surgery vary markedly among hospitals.7 This variation is important, since complications have been shown to correlate with morbidity and mortality in large population-based studies.8,9 Many of these complications may be avoidable given the higher quality of health care.10,11 We hypothesize that low-volume centers have a higher prevalence of postoperative complications and that these differences contribute to the higher mortality rates observed at these centers.3-5 The current project is a statewide observational study to determine whether the observed association of hospital volume with in-hospital mortality is due to systematic differences in patient case-mix or to differences in postoperative complications. The results of this project will help hospitals and policymakers make informed choices regarding regionalization of patients to high-volume centers for high-risk surgery. Patient and hospital characteristics were obtained from the state discharge database maintained by the Health Services Cost Review Commission (HSCRC) of Maryland. Data for all adult patients who had International Classification of Diseases, Ninth Revision, Clinical Modification12 (ICD-9-CM) primary procedure codes for hepatic resection (ICD-9-CM codes 50.22 and 50.3) during 1994-1998 were included (N = 569). Demographic variables (age, gender, race), nature of admission, operating physician, hospital identification number, primary ICD-9-CM diagnosis and procedure codes, and up to 15 secondary ICD-9-CM diagnostic and procedural codes were abstracted from the HSCRC database. Comorbid disease states were identified from the secondary ICD-9-CM diagnosis codes. We used the Romano modification of the Charlson comorbidity score for use with ICD-9-CM codes during the index hospitalization to adjust for differences in outcome from comorbid disease.13-15 To adjust for the severity of disease, we included the nature of admission (elective vs urgent/emergent) and the extent of operation (hepatic wedge resection [ICD-9-CM code 50.22] vs hepatic lobectomy [ICD-9-CM code 50.3]). In-hospital mortality is routinely available from the HSCRC database and was the primary outcome variable. Hospital length of stay was obtained from the discharge abstracts to compare the relative resource use at high- and low-volume hospitals. The prevalence of several postoperative complications was determined by querying the secondary diagnostic and procedure codes available in the database. To validate the coding of these complications for high-risk surgical patients, a random sample of 25 medical records from one hospital was performed and the codes were found to be 96% accurate.18 This method of determining complications has also been shown to be valid in a large population-based study, the Complications Screening Project, where physicians reviewed medical records and confirmed ICD-9-CM coding of several specific postsurgical complications.10,11 The positive predictive value for included complications varied from 84.2% to 96.8%, with κ scores of 0.69 (good agreement) to 0.88 (almost perfect agreement) when comparing ICD-9-CM coding with the medical record.11 The ICD-9-CM codes for complications were as follows: aspiration (507 and 9973); pulmonary insufficiency (5184, 5185, and 5188); cardiac complications (9971); pneumonia (480-487); acute renal failure (584); septicemia (038); postoperative infection (9985); cardiac arrest (4275); acute myocardial infarction (410); reintubation (9604); reoperation for bleeding (3941, 3949, and 3998); and surgical complications after a procedure (9981-9983). Descriptive analyses are presented as means and SDs for normal data or medians and interquartile range (IQR) when data did not assume normal distributions. Univariate tests of association were performed, using the χ2 test for categorical outcome and categorical predictor variables, simple logistic regression for categorical outcome and continuous predictor variables, t test for parametric continuous outcome and categorical predictor variables, Wilcoxon rank sum test for nonparametric continuous outcome and categorical predictor variables, and simple linear regression for continuous outcome and continuous predictor variables. Variables with univariate association (P<.20) were included in the multivariate analysis. Two sequential analyses using multiple logistic regression with in-hospital mortality as the dependent variable were performed. In the first analysis, the association of mortality and hospital volume was estimated after adjusting for all significant independent case-mix variables (age, gender, race, 10 comorbid diseases, extent of procedure [lobectomy vs wedge resection], and nature of admission [elective vs urgent/emergent]). In the second analysis, postoperative complications that were significantly different between low- and high-volume hospitals were entered into the multivariate logistic regression model. Using this staged analysis, it is possible to isolate the relative importance of case-mix and complications in accounting for the variation in mortality between low- and high-volume hospitals. Multivariate analyses were tested for goodness of fit using the Hosmer-Lemeshow method, and the area under the receiver operator characteristic curve was calculated. The results are presented as odds ratios (ORs) and 95% confidence intervals (CIs). Statistical significance was set at P<.05. Data analysis was performed using STATA statistical software (Version 6 or 7) (Stata Corp, College Station, Tex). There were 569 patients who underwent hepatic resection in Maryland from 1994 to 1998. Of these, 338 (59%) had hepatic wedge resection and 231 (41%) had hepatic lobectomy. Three high-volume hospitals performed 422 (74%) of these procedures and the remaining 147 procedures (26%) were performed at 32 low-volume hospitals. Demographics and comorbid diseases of patients who had surgery at high- and low-volume hospitals are presented in Table 1. Patient age, gender, and type of procedure (wedge resection vs lobectomy) were similar at high- and low-volume hospitals. Low-volume hospitals had more nonwhite patients (35% vs 22%; P = .002) and more operations for urgent/emergent indications (30% vs 16%; P<.001). The burden of comorbid disease was similar for patients at high- and low-volume hospitals. The overall in-hospital mortality rate was 4.8% for all patients undergoing hepatic resection in Maryland from 1994 to 1998. High-volume hospitals had a significantly lower mortality rate (2.8%) than low-volume hospitals (10.2%) in a univariate analysis (P<.001) (Table 2). Length of stay was similar for the high- and low-volume hospitals (median, 7 days; IQR, 6-11 days). There was a significantly decreased hospital cost at high-volume centers (median, $10 840; IQR, $7181-$16 803) compared with low-volume centers (median, $11 776; IQR, $9160-$16 577). Several case-mix variables were associated with in-hospital mortality in the univariate analyses (Table 1). Comorbid diseases associated with an increased risk of in-hospital mortality in a univariate analysis included peripheral vascular disease (P = .07), mild liver disease (P = .05), moderate/severe liver disease (P<.001), chronic renal disease (P<.001), diabetes with complications (P = .003), and history of myocardial infarction (P = .14). The extent of resection was associated with in-hospital mortality, with higher mortality for patients undergoing complete hepatic lobectomy (7.4%) vs wedge resection (3.0%) (P = .02). Likewise, patients who underwent urgent or emergent procedures were at higher risk of death (8.9%) than those undergoing elective procedures (3.7%) (P = .02). In a multivariate analysis accounting for all independent case-mix variables that were associated with in-hospital mortality, having surgery at a low-volume hospital was associated with a 3-fold increased risk of in-hospital mortality (OR, 3.1; 95% CI, 1.2-7.6; P = .02). Hospital volume was significantly associated with mortality even after adjusting for differences in nature of admission and race (important variables that differ between high- and low-volume hospitals). Other variables independently associated with an increased risk of in-hospital mortality in the multivariate analysis were chronic renal disease (OR, 24; 95% CI, 5.3-111; P<.001) and preexisting liver disease (OR, 7.0; 95% CI, 1.6-30.4; P = .009). There was a trend toward significance for the extent of surgery, with an increased risk of mortality associated with hepatic lobectomy compared with wedge resection (OR, 2.2; 95% CI, 0.9-5.7; P = .09) and urgent/emergent admission compared with elective admission (OR, 2.1; 95% CI, 0.8-5.9; P = .10) (Table 3). There was marked variation in complication rates between hospitals (Table 4). Figure 1 shows the variation in complication rates between hospitals. Aspiration exhibited the least variation, with an extremal ratio (ratio of the highest to the lowest rate) of 2.10 (range, 4.8%-10.1%) compared with reintubation, which showed the most variation, with an extremal ratio of 29.8 (IQR, 0.4%-11.9%) (Table 3). To obtain statistically precise complication rates, only hospitals that performed at least 20 hepatic resections (78% of the patients) during the study period were included in the variation analysis. However, all patients were included in the remaining analyses. Most of the postoperative complications studied predicted in-hospital mortality after hepatic resection. Specific complications placing patients at risk for mortality included cardiac complications (relative risk [RR], 3.6; 95% CI, 1.4-8.8; P = .005), surgical complications (RR, 4.5; 95% CI, 2.0-10.0; P<.001), reintubation (RR, 13.4; 95% CI, 6.9-26.2; P<.001), pulmonary failure (RR, 5.0; 95% CI, 1.9-13.1; P = .001), septicemia (RR, 5.3; 95% CI, 1.8-15.5; P = .002), pneumonia (RR, 3.4; 95% CI, 1.1-10.4; P = .03), acute renal failure (RR, 23.5; 95% CI, 13.7-40.4; P<.001), and acute myocardial infarction (RR, 7.2; 95% CI, 1.4-37.5; P = .02). Aspiration and postoperative wound infection were not associated with mortality in this univariate analysis. In a second univariate analysis, several postoperative complications were associated with the dichotomous hospital volume variable. The significant complications included reintubation (RR, 2.5; 95% CI, 1.8-3.4; P<.001), pulmonary failure (RR, 2.3; 95% CI, 1.6-3.5; P = .001), pneumonia (RR, 2.35; 95% CI, 1.0-5.6; P = .05), acute renal failure (RR, 2.0; 95% CI, 1.1-3.7; P = .07), acute myocardial infarction (RR, 2.6; 95% CI, 1.2-5.9; P = .10), and aspiration (RR, 1.4; 95% CI, 0.9-2.0; P = .11) (Table 5). All complications with P<.2 were included in the second multivariate analysis, which tested the relative importance of case-mix, complications, and hospital volume in predicting in-hospital mortality. For the second multivariate analysis, reintubation, pneumonia, and pulmonary failure were combined owing to a high level of colinearity. The combined variable was labeled "pulmonary complications" and entered into the final multivariate model. This final multivariate model was constructed by entering significant case-mix variables, postoperative complications, and the hospital volume variable into a logistic regression model (Table 6). This analysis revealed no residual association of hospital volume and mortality after adjusting for postoperative complications (OR, 2.1; 95% CI, 0.6-5.2; P = .22). However, having pulmonary complications (OR, 12.8; 95% CI, 3.6-46.0; P<.001) or acute renal failure (OR, 16.1; 95% CI, 1.9-138; P = .012) placed the patient at a profound risk of in-hospital mortality. The empirical relationship between high hospital volume and improved outcomes is well established for several high-risk surgical procedures. Using the Maryland state discharge database, our data once again demonstrate the strong association of hospital experience and decreased mortality after hepatic resection. Patients undergoing surgery at low-volume hospitals had a 3-fold increased risk of in-hospital mortality after adjusting for differences in patient characteristics. In addition, we demonstrated that patients who have surgery at low-volume hospitals are at risk for several specific postoperative complications. These include life-threatening complications, such as acute renal failure, pulmonary failure, reintubation, and nosocomial pneumonia. After entering these complications into the multivariate model, hospital volume was no longer statistically significant, suggesting that the mechanism of improved outcome at high-volume hospitals may be fewer postoperative complications. Several population-based studies have demonstrated improved outcomes for patients who undergo hepatic resection at high-volume vs low-volume centers. Begg et al5 merged data from the Surveillance, Epidemiology, and End Results database with clinical data for Medicare patients and studied the effect of volume on outcomes for several high-risk surgical oncology procedures. This study showed a significant reduction in 30-day mortality associated with high-volume hospitals after hepatic resection for malignancy (5.4% at low-volume vs 1.7% at high-volume centers). Two studies using state discharge databases from Maryland and California also demonstrated decreased mortality at high-volume centers. Choti et al4 reviewed 606 liver resections done in Maryland between 1990 and 1996. High-volume hospitals in Maryland had an in-hospital mortality rate of 1.5% vs 7.9% at low-volume hospitals (P<.001). Using the discharge database in California, Glasgow et al3 studied the influence of hospital volume on outcomes of hepatic resection for hepatocellular carcinoma. For 507 patients, risk-adjusted operative mortality was 22.7% at low-volume centers and 9.4% at high-volume centers (P = .002). The latter study from California was exclusively investigating hepatocellular carcinoma, which represents a higher-risk patient population due to the frequency of underlying liver disease and the large extent of resection necessary to obtain negative margins. The relationship of hospital experience to both clinical and economic outcomes is well known. 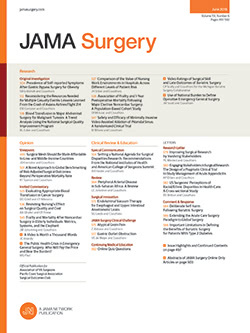 Well-designed studies have shown significant volume-outcome effects for several high-risk surgical procedures, including hepatectomy, esophagectomy, pancreaticoduodenectomy, abdominal aortic aneurysm repair, coronary artery bypass grafting, and many others.3-5,18-23 The health policy implications of this volume-outcome relationship are important. Many policymakers have suggested regionalizing complex surgery to high-volume centers of excellence, and some health policy initiatives are currently underway. For example, the Leapfrog group, formed by the Business Roundtable in an attempt to spearhead quality improvement efforts in health care, has included "evidence based hospital referral" as one of their 3 initial efforts.24,25 Currently, the best surrogate for quality of care at different hospitals is hospital experience. To concentrate patient care in the hands of high-quality (high-volume) hospitals, the Leapfrog group has set minimum volume standards that institutions must meet to provide those services to their patients. Birkmeyer and colleagues26 estimated that almost 2600 deaths after surgery could be avoided in the United States each year by "universal adoption" of this evidence-based hospital referral policy. The hospital volume variable is complex and likely represents several structure and process differences between high- and low-volume hospitals. Isolating these differences will allow for changes at low-volume hospitals that will improve outcome. Some evidence exists that demonstrates the importance of intensive care unit (ICU) physician and nurse staffing in predicting outcomes after complex surgery. Having daily rounds by an ICU physician was associated with a 4-fold reduction in mortality and a decreased risk of complications after hepatic resection in one recent study, and has also been demonstrated for other high-risk surgical procedures.30,31 In addition, having "more nurses" (1 ICU nurse to 1 or 2 patients) in the ICU at night was associated with fewer pulmonary complications and less resource use after hepatic resection.32 These differences in ICU structure may contribute to differences in complications between high- and low-volume centers, which can be changed to improve outcomes at lower-volume centers. This study has several limitations. First, using administrative data to analyze health outcomes been shown to be less accurate than using clinical data or medical record review. Using secondary diagnostic and procedure codes to retrieve comorbid diseases and postoperative complications may be affected by mistakes in coding. However, medical records were pulled for a subset of patients undergoing high-risk surgery at one hospital, and the coding of comorbid disease and complications was found to be 96% accurate.31 Furthermore, most postoperative complications were associated with in-hospital mortality in our analysis, lending additional internal construct validity. To accurately predict patient death, the complications must be measuring important differences in patient care between hospitals. Despite the limitations of using administrative data, few other sources allow comparisons across all hospitals in a given geographic area. Institutions that participate in prospective clinical studies or randomized clinical trials are likely to have high-quality performance, which does not give a representative view of health services for all patients. Using large administrative data allows the study of true "effectiveness" of interventions rather than the "efficacy" demonstrated in a clinical trial. In conclusion, this study demonstrates that lower mortality rates after hepatectomy at high-volume hospitals are attributable to fewer postoperative complications. To our knowledge, this is the first study to demonstrate that differences in rates of complications may contribute to the empirical volume-outcome effect. There are important health policy implications associated with these findings. First, these data support the regionalization of patients to high-volume centers of excellence for high-risk surgery since the volume-outcome relationship seems to be improved quality of care rather than differences in case-mix. Second, low-volume hospitals should implement quality improvement efforts to minimize postoperative complications, with an ultimate goal of decreasing in-hospital mortality rates after high-risk surgical procedures. Based on our findings, acute renal failure and pulmonary complications should be targeted for quality improvement at lower-volume centers. Corresponding author and reprints: Pamela A. Lipsett, MD, The Johns Hopkins Hospital, Department of Surgery, 600 N Wolfe St, Blalock 685, Baltimore, MD 21287-4685 (e-mail: plipsett@jhmi.edu).